2012 Summer Trend; NEON Nails - Polish Displays Available NOW!! NEON - Do you offer it? Your nail clients will want neon shades, and they will want them ALL! I walked into Sephora yesterday and in the center of the store was a newly erected display of neon polishes. This huge 360 display of bright and beautiful colors had shoppers of all ages mesmerized. The display was mobbed, and I was fighting my way through the crowd to see them for myself. These LOUD and obnoxious shades of summer were tempting and irresistible until one by one we all began to realize these trendy hues were selling at $14+ each! Being that the popular trend is to use 2-3 different colors on each hand, this was turning people away. One woman commented, "I don't need to buy $42 bucks of these polishes, I'll just get a manicure - I am sure they have these colors at my salon!". Well let's hope so! I think it is wise for salons and spas to closely follow the trends set forth in media, fashion and big retail. Neon is trending, and you can't escape it, it's everywhere!! Thumbing through look books from Nordstrom, Bloomingdales and Saks this week I spotted the neon trend in accessories, clothing, shoes, and nails! 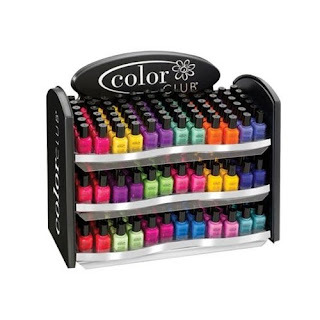 So make sure your salon has a great selection of neons for your fashion forward clients. This 216 piece display from Color Club boasts a great price as well as a great selection of the top neon colors of the season, at a fabulous price. Your cost is approx. $1.62 each, low enough so that you can set the suggested retail price to be attractive to clients ($5 - $6) and still make a great profit. 18 great neon shades to choose from! Available only to licensed beauty professionals at PureSpa.com!